With the massive appearance of the Orthodox icon as perhaps the only generally accepted valid Christian art in the later part of the 20th century, one tends to forget that the classic icon – with its familiar rigorous Byzantine style – was not the icon actually accompanying the restoration of Orthodox life in Greece after the war of liberation in the 1820s. In the 19th century, the old stylistic tradition of Orthodox painting was put under severe pressure from the western European art with its Nazarene sweetness and naturalism. Sometimes one may also find this kind of religious paintings characterized as ‘italianate’. In Russia, yet particularly in Greece, much 19th century icon painting testified to this western influence. Undoubtedly, no phenomenon occupies as important a place in Orthodox devotion than icons. In Greece, however, 19th century icons were mostly made in western style. This style dominated icon painting to a degree where the old Byzantine tradition often only survived as a few odd features in otherwise western style icons – and then, of course, in a number of magnificent old icons and medieval frescoes or mosaics. Beginning in Russia in the 1880s, in Greece, however, by and large much later – perhaps not really until after the middle of the 20th century – Orthodox icon painting experienced a return to the traditional Byzantine style. Today, this style plays a dominant role in all Orthodox art. Yet, even today, western style icons (see smaller picture) are sometimes used as devotional instruments. The photograph shows us the studio of the icon painting monks. 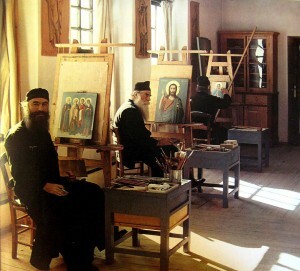 Even though they might have consulted their own library in order to find Byzantine models, all the icons on the easels are motifs rendered in western style: a group of male saints, three old and one young, a Christ and a Virgin Mary. On the walls between the windows hang large model sketches of saints, these equally testifying to a western way of rendering the drapery etc. While the sketches – if transferred in that size to a painting – would suit the iconostasis of a church, the icons on the easels are rather small (the Virgin Mary probably with a height of less than 30 cm. ), most likely the kind of icon one would acquire for one’s home, or donate to hang on the wall of some church. So, while the icon in Greece represents a long and distinguished tradition, the stylistic impulses of western religious art lead to a century of ‘westernized’ icon painting, which was, then, left again by icon painters and patrons to pursue a restoration of the traditional Byzantine form. Today, this style dominates all orthodox art, and has since the 1960s (mass-tourism!) found its way into many Christian communities in a way the ‘Italianate’ paintings never managed – and probably never would have managed, since their form was associated too much with Catholicism.